An L-plate, sometimes called an L-bracket, is a camera accessory that allows you to quickly clamp a camera body to a tripod ballhead in both a landscape and portrait orientation. L-plates generally use rail widths that are defined by the Arca-Swiss standard, and they should clamp securely into the quick-release ballhead clamps that are made by many manufacturers such as Really Right Stuff, Acratech, Kirk, Induro, Arca-Swiss, 3-Legged Thing and Wimberley. 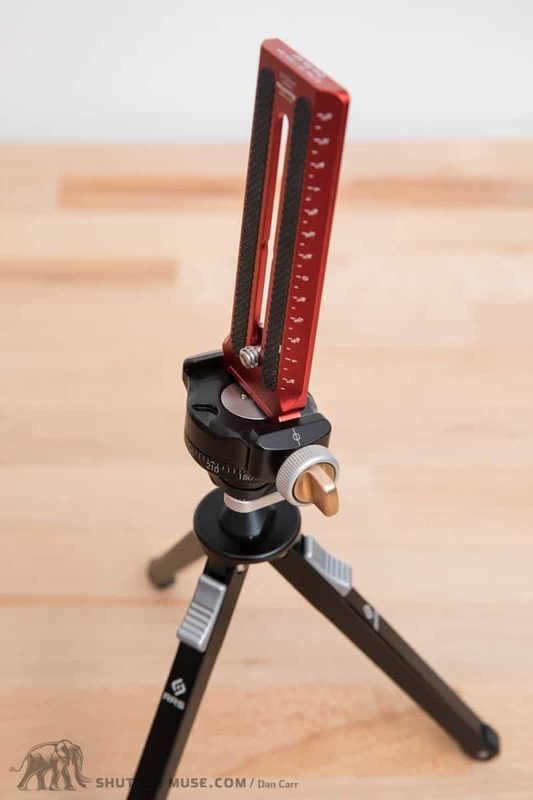 For those that use Manfrotto tripod heads with their own proprietary clamp, your options are limited, but there is a Manfrotto Q2 universal L-plate available. Quick release tripod plates are quite commonly used, but they often only cover a small area of the camera’s base around the 1/4 20″ threaded socket. An L-plate is much larger, and has both a horizontal clamping area along the bottom of the camera, and a vertical clamping area that is perpendicular to the cameras’s base on the left-hand side. 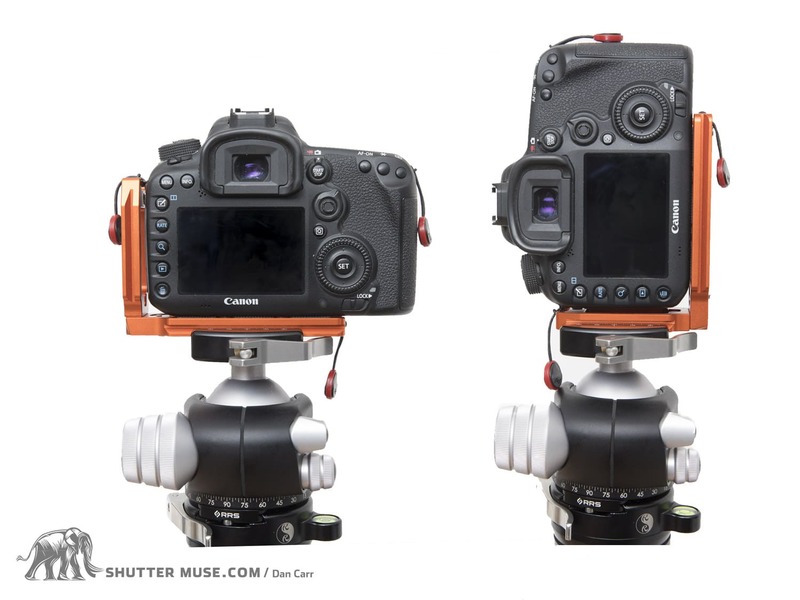 When attaching your camera to the ballhead’s quick release clamp, you can clamp it to either the horizontal rail or the vertical rail, to place your camera into either landscape or portrait orientation. Switching your camera from landscape orientation to portrait orientation is simplified when using an L-plate because the change in camera positioning is greatly reduced compared with using a a standard plate and a ballhead drop notch (see below image). With an L-plate in use the camera almost rotates around the axis of the lens, resulting in very little vertical change and no horizontal shift at all, assuming you clamp the camera back in the centre of the clamp again. 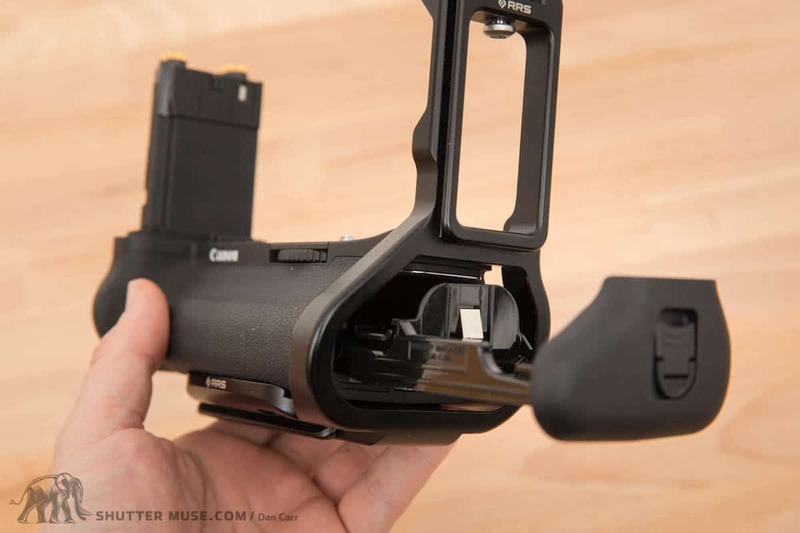 Of course you do need to actually release the quick-release clamp to make the positioning change, but this is a fast process, especially if you’re using a lever-release clamp (recommended). Orientation change with no L-plate. When using the ballhead drop notch for portrait orientation (above photo), the camera is moved dramatically off to one side and also shifted downwards. Not only will the camera be in need of much greater repositioning, but it also means that it is no longer at the most comfortable working height. I find that the ease in which you can switch orientation with an L-plate means you tend to experiment a lot more and try to look for compositions that work with with both setups. 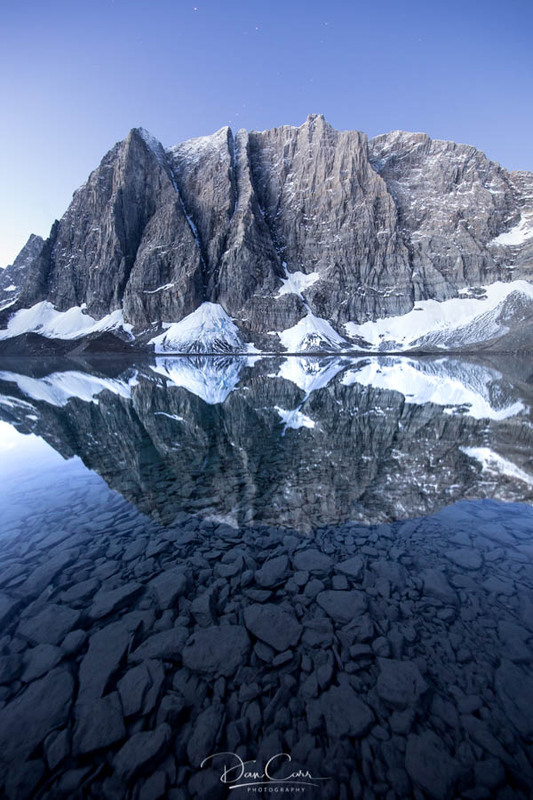 To me that’s a big bonus, because I often travel great distances and spend huge amounts of time searching for those perfect landscape moments. When everything comes together – weather, location, light – I want to really capitalize on that as quickly as possible, and come away with a good variety of images. An L-plate helps, and encourages me to do that very quickly. 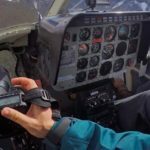 So an L-plate is a useful for simplifying and speeding up the process of switching orientation, but it can also help you get sharper images! As you an see from the previously used image that shows the camera without the L-plate, when it’s in a drop notch it no longer has its weight over the centre point of the tripod. This makes it much less stable, particularly in high winds or when the tripod is on soft, uneven ground. This problem is definitely lessened if you are shooting with a lightweight mirrorless setup, but if you have a heavy DSLR with a large zoom lens such as the Canon 11-24mm that took the above mountain images, it really destabilizes your setup. Not only will the sharpness of your images suffer from this overall dip in stability and vibration dampening, but you could also tip the tripod over and damage your gear. If you’ve gone to the expense of buying a nice tripod and a great ballhead, it’s not ideal to compromise that with a camera at 90 degrees in the drop notch. The other way in which an L-plate can help you is to prevent rotation of your camera on the tripod plate. When a small, standard tripod plate is used, there’s considerably less area of plate touching the base of your camera, and this means it’s much easier for the plate to rotate. It becomes even easier for this to happen when the camera in hanging off the side of the ballhead in the drop notch, with the weight of the lens torquing both the tripod plate and the ballhead itself. A camera in this position can sag downwards over the duration of long exposures, either by the camera rotating on the tripod plate, or the ballhead rotating under the strain of the camera. Without an L-plate, the camera in a drop notch can destabilize a tripod, and the lens weight can cause the whole setup to sag. If you use an L-plate these issues can be prevented, or at the very least, severely mitigated. Compared to a small, standard plate such as the one used in the above photo, L-plates make contact with a larger surface area on the base of the camera and this makes them much less likely to rotate when placed under large torques. Some L-plates are even designed specifically for your camera and they actually curve around the camera base, making it completely impossible to rotate the plate. When I purchased my first camera L-plate I hadn’t really considered the additional protection that’s offered by having something on the bottom of the camera. I often put my camera down on the ground when I’m working, and over time I noticed that small scratches and chips had formed in the base of the L-plate. In a way it was acting sacrificially, because that damage would otherwise have been on the camera. When it came time to sell that particular camera, I unscrewed the L-plate that had been on it for its whole life, and the bottom of the camera looked as good as new. This undoubtedly allowed me to sell the camera for a higher price, and I’d go so far as to say that it actually saved me more money in the second hand sale, than the plate had cost me to buy in the first place! If you reach the conclusion that you want to buy an L-plate then you’ll have to make an important decision: Specific or Universal? Manufacturers like Really Right Stuff create L-plates that are designed specifically for one model of camera. The advantage of this is that they can be machined in such a way as to avoid causing interference with the battery door on your camera’s base, and also to some extent, the port covers on the left of the camera. These camera specific plates are also designed to wrap slightly around the edges of the camera’s base, which add a little extra protection to the camera, and also adds stability to the plate by preventing the base from twisting. 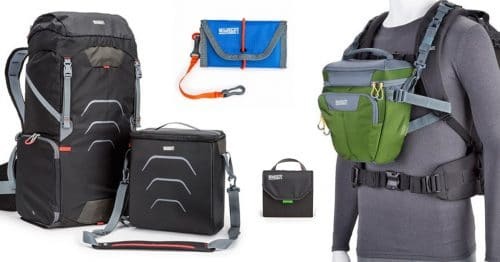 On newer models of L-plates, Really Right Stuff actually take things a step further and have the vertical rail of the L-plate connect with the shoulder strap lug on the left-hand side. This adds further rigidity by preventing any torsional twisting of the rail with a heavy lens setup in portrait orientation. Several of their mirrorless camera L-plates also include an option to add a more ergonomic grip to the camera. A universal L-plate such as this one from 3-Legged Thing, will have a way adjust the horizontal positioning of the plate on the base of the camera. This is necessary because not all cameras have their 1/4 20″ threaded sockets in the same place. Loosening the screw will also allow you to slide the plate out of the way of the battery door. There can be no doubt that camera specific L-plates are better than universal ones, but the added complexity of their design means that they are often quite a lot more expensive than some of the universal options out there. The other issue is that their longevity is limited to the length of time you own that one camera. If you’re someone that likes to constantly upgrade to the latest and greatest model, it can definitely add some serious expense to things when you have to keep buying new L-plates. Having said that, I stand by what I said in the previous section with regards to camera protection. A well protected camera will sell for a higher price on the second-hand market, and that will absorb most, if not all of the cost of the L-plate – especially if you also factor in selling the L-plate on eBay at the end of your camera’s life. Universal L-plates on the other hand have come down in price quite a lot in recent years, so they make an attractive option for people who want the L-plate benefits, but perhaps have limited photography gear funds. A camera specific L-plate, such as this one from RRS, will not interfere with the battery door, and is also contoured to the shape of the camera to prevent plate rotation under high torque. I should also make a note in this section about using universal L-plates with pro-sized camera bodies, or cameras with a battery grip. Since cameras like this are much less numerous in the market, it turns out that there really aren’t any good universal L-plates that are designed to work with a larger camera. The majority of larger bodied cameras and battery grips have the battery door on the left side of the grip, so any kind of universal L-plate would cause major interference with that. You might also find that the vertical arm of any sort of universal plate is simply not long enough. 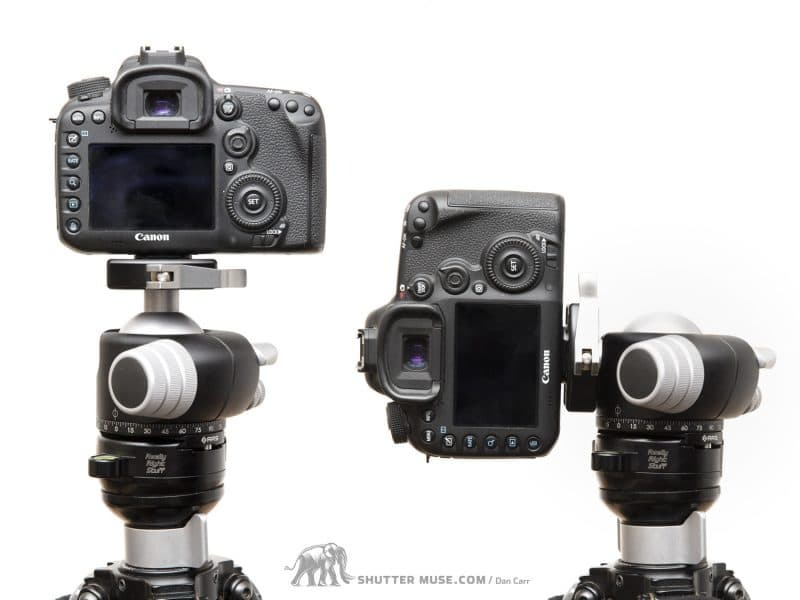 The increased height of these larger camera bodies requires a longer vertical arm in order to be able to correctly clamp the camera in a central position when being used in a portrait orientation. My advice if you do have one of these larger cameras, is to go with a camera specific plate such as the one in the photo, that has a machined opening for the battery to be removed. A camera specific L-plate will allow you battery access with a battery grip. There’s several disadvantages of using an L-plate that are worth discussion. I personally don’t consider any of these to be deal breakers, but this wouldn’t be the “Ultimate Guide” without giving them some consideration. The first negative of an L-plate is the added weight to your camera setup, over something like a simple low-profile, square Arca-Swiss plate like the tiny Standard Plate from Peak Design. That Standard Plate weighs just 14 grams, whereas a universal L-plate is likely to weigh in the region of 130 grams. If you’re looking for the absolute lightest camera setup then adding an L-plate might not be your best choice. One option that you have is to use one of Really Right Stuff’s two-piece L-plates that allow you to remove the vertical arm. If you only need to keep weight down for some circumstances, this allows you to make adjustments. The second negative of an L-plate is the added bulk to your camera, but this might not manifest itself in the way you first imagine. From a usability point of view I don’t mind the bulk at all, but where you might run into trouble is using camera bags and cases that are designed around the specific sizes of a camera. My primary camera in most circumstances is a Canon 5D Mark IV, and I use it both with and without a battery grip, and always with L-plates for both setups. 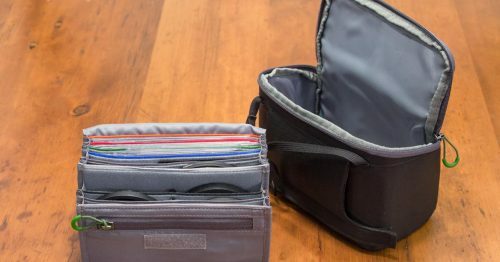 While I’m reviewing camera bags and cases for this site I often run into the problem that my camera is quite a tight fit, both horizontally and vertically in certain bags. 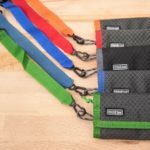 Most manufacturers try to make bags that aren’t bulkier than they need to be, and this can make for a tight squeeze sometimes. An L-plate can make it harder to access ports on the camera, even with a camera specific plate such as this one. The third negative that I’ve come across is that L-plates tend to make it harder to access the ports on the left side of a camera. 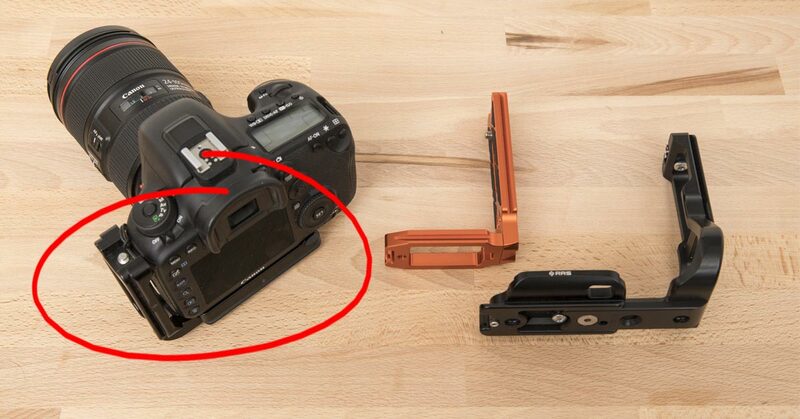 This disadvantage can be greater if you’re just using a universal L-plate because such plates do not have slots and cut-outs to work specifically with the ports on your camera. 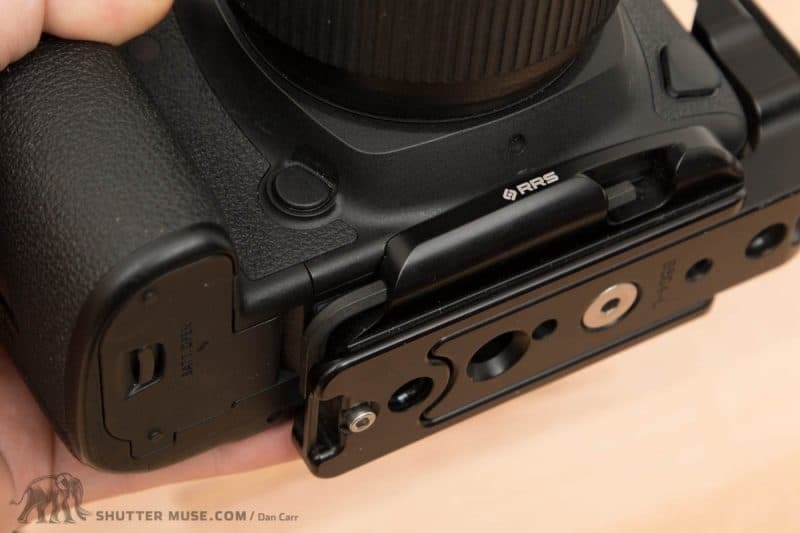 A camera specific L-plate can somewhat mitigate this disadvantage because manufacturers try to shape the vertical part of the L-plate in such a way that it doesn’t interfere with the ports and their covers. Even so, my experience with many RRS camera specific L-plates tells me that they are still much harder to work with than if you didn’t have the L-plate on the camera at all. 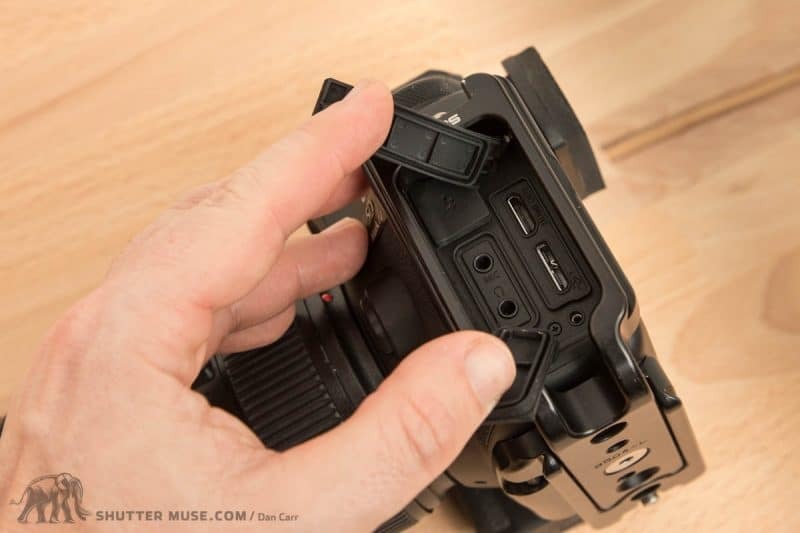 To further combat this issue, you can find some L-plates that include a way to shift the vertical part of the plate an inch or two away from the camera body, and thus out of the way of the ports and port covers. Whilst this alleviates the port usage issue, these plates almost always require you to use a tool to adjust the plate into that extended position, which takes time and is an annoyance in the field. You can’t really leave the plate in the extended position because this would almost certainly prevent you from getting the camera into your camera bag (see second negative point again!). The fourth and final negative is that some universal L-plates block access to the battery door, requiring you to carry a hex tool around with you all the time. Camera specific L-plates are always designed so that they do not interfere with the battery door, but that is simply not possible with the universal options. Universal L-plates that include a large amount of horizontal adjustment, such as the recommended one from 3-Legged Thing, can often be set up in a way that doesn’t cause this problem with a full sized DSLR, but it usually is an issue for smaller mirrorless cameras where the horizontal part of the plate covers the majority of the camera’s base. As far as I’m concerned, these four things are the biggest things that might cause people annoyances when using an L-plate. Like I said, I don’t consider any of them to be deal breakers because the positives of an L-plate far outweigh them, but perhaps your mileage will vary. 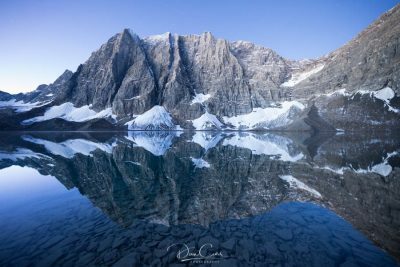 If you were to get a group of ten avid landscape photographers together in the same place, it’s a certainty that some of them will be using Really Right Stuff L-plates on their cameras. When it comes to camera specific plates, there’s simply no better option. 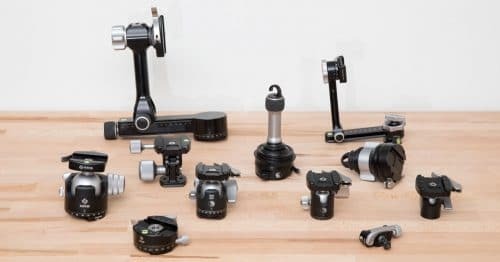 If you guys have read my huge Really Right Stuff Ballhead Showdown article then you’ll know I’m (generally) a fan of this company’s products, and it doesn’t stop at the tripods and ballheads. When I decide to buy a newly announced camera for my work, I immediately pre-order the matching RRS L-plate, sight unseen. Simple as that. I trust the products, and whilst the bracket isn’t cheap, you know my thoughts on the camera protection aspect by now. I should also point out that there are some universal L-plates from companies such as Acratech and Arca-Swiss, that are actually more expensive than the purpose made ones from RRS. So there aren’t the most expensive option on the table. Due to the generally high regard for RRS products, the second-hand value and saleability of their plates is very good when it’s time to move on to the next camera. I realize that it’s not possible for everyone to commit to the higher price of the RRS L-plates, but thankfully there are some other options out there so everyone can enjoy the advantages of a good L-plate system. If one of the things that concerns you most about an L-plate is the added bulk and weight, then the iQuick plate from UniqBall is a very… um… unique kind of L-plate. The iQuick plate has two brilliant features in it: Firstly it has two bubble levels built into the back and the end of it, and secondly the vertical end of the L-bracket it so tiny that you’d almost not notice that it’s an L-plate at all! 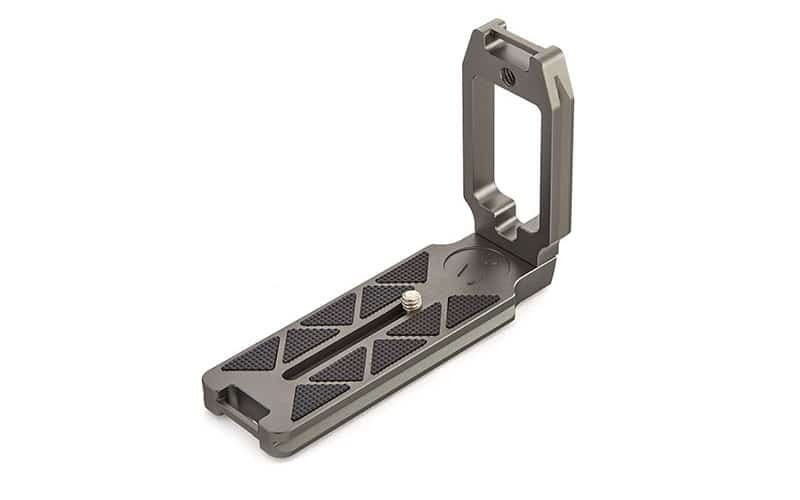 At first glance it just looks like a regular flat tripod plate, but closer inspection reveals that it does have about a half inch of vertical rail on the one end of the plate. It might not be the best choice for a very large camera setup, but for small-medium setups I think it’s a brilliantly innovative design, and at $129 it’s a little cheaper than some of the full-sized RRS brackets. If you still want to spend less than this, I can highly recommend the previously shown QR11-LC universal L-plate from 3-Legged Thing. At only $49 it’s a great price, and yes it also comes in black if that garish orange colour isn’t your style! I’ve written a review of this QR11-LC plate in the past, so you should check that out for further details if you think this might be the option for you. At the bottom end of the pricing scale we have the $39 universal plate from Sunway Photo. Like the QR11-LC, this is also a solidly built item, but it’s not quite as easy to adjust as the one from 3-Legged Thing. 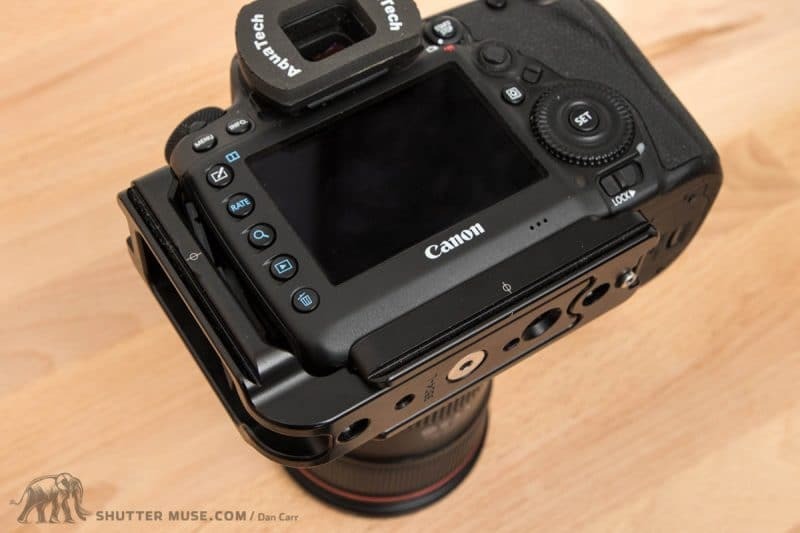 On the $49 3LT plate, the long horizontal adjustment slot is really useful if you need to slide the plate to access the battery door of the camera, or move the vertical arm away from the cable ports. Simply loosen the screw on the base and slide the bracket over. The cheaper $39 plate from Sunway Photo has a variety of holes to us for the base screw, but as you can see, it requires the removal of the screw to move it to another slot so it’s not quite as fast and easy to work with. Nonetheless, a good solution for the budget-conscious. I’ve been wanting to write this guide for a long time because I get so many questions about these accessories, and I haven’t come across anywhere else that has pulled together all of this information into one place. If you’re a landscape photographer who often uses a tripod, I’ve no doubt that you’ll benefit from using an L-plate and with such affordable options out there I really think it should be on the essentials list. Hopefully this guide has answered all the questions you might have on the topic, but if not, please leave me a comment below and I’ll be happy to help. Excellent review. Good work. I too am an an L-bracket addict, though not so much for use for tripods. I am a journalist and I use these for camera protection. They get knocked around a bit and the L brackets absorb much of the abuse. Couple of points: Neewer made a superb dirt-cheap Canon 5D3 dedicated one-piece. I don;t know if they are making a dedicated 5D4. Sunwayfoto makes a pretty good inexpensive one-piece 5D4 bracket but tends to loosen. RRS stuff is great but who can afford it? I mistrust two-pieces as every joint represents a place to come loose at inopportune moments. And buy lots of allen wrenches at True-Value — they are about fifty cents each — and scatter them in your bags — the brackets will need tightening occasionally. Thanks for sharing your insights, John! It’s really interesting to hear that your primary use is protection. I do use RRS plates on some cameras, and I’ll say that I’ve never eve had to tighten one in the field, either a one-piece or two-piece. The reason for this is that plates come loose when they can move very slightly, but with the RRS plates that are shaped to the camera, they simply can’t move at all. Also the vertical arms of their two-piece designs actually clamp to the strap boss on the camera, so again there’s no way for it to flex and loosen. I appreciate that they are expensive, but you do get what you pay for IMO. I would like to use a Three Legged Thing universal L bracket on my Canon 80D. According to B & H all ports are accessible, but it interferes with the articulating LCD screen in the vertical position. As a result, an L bracket is pointless. Darn! That’s unfortunate indeed.I would imagine that RRS make a dedicated one for the 80D so this could be an option for you. I was wondering if L plates work on ball heads that do not have arca type mechanism . 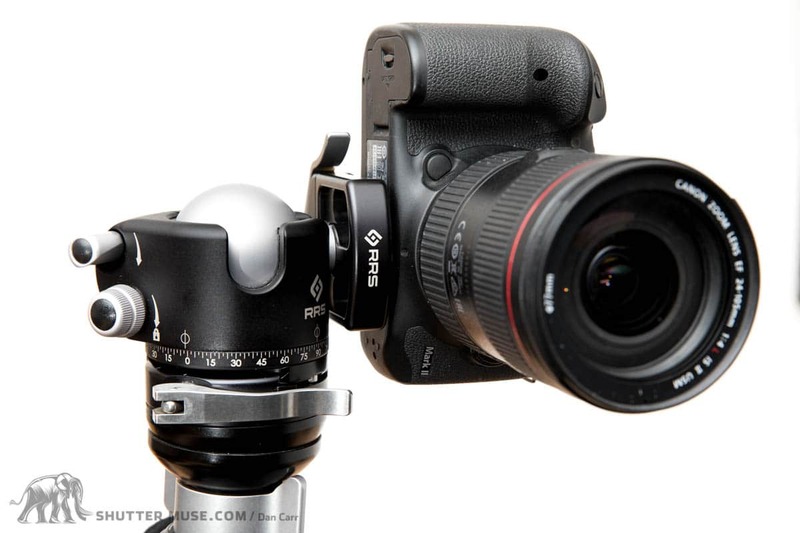 for example – Manfrotto MHXPRO-BHQ2 XPRO Ball Head with 200PL Quick-Release Plate. Will the L plate made by 3 legged stuff work on this ball head or any other such ball heads with similar release mechanism? No, you really need an arca clamp I’m afraid. There is a Manfrotto 200PL L Plate available I believe but it’s universal. Slight typo in your articles title. “Choosing” instead of “chosing”. 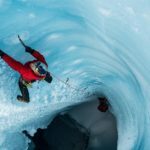 Very good article, many thanks! 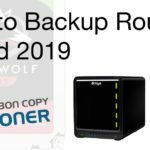 Quick advice please…. Would you guys know if I can use RSS Custom L PLATE with manfrotto 410 Junior head. 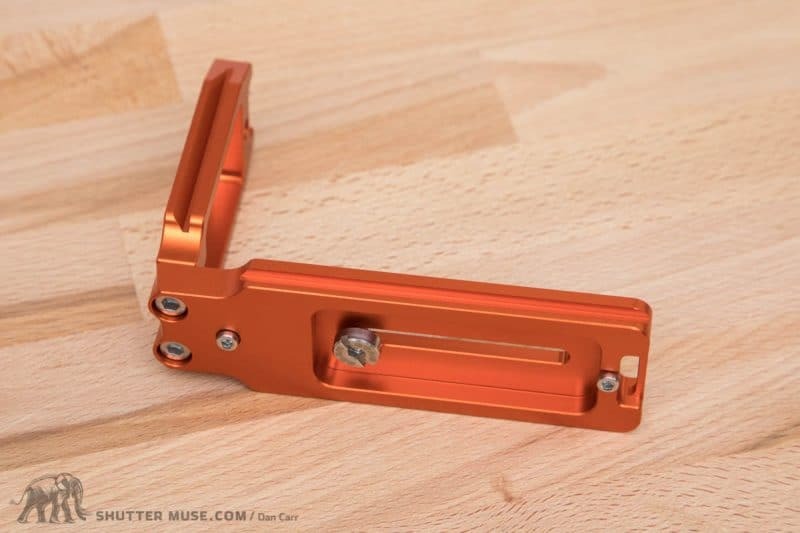 Would I need a RSS clamp as well? 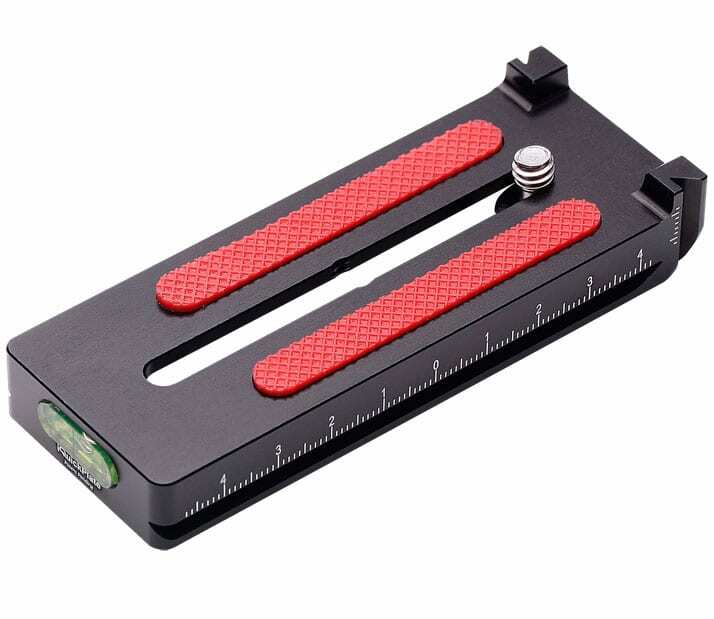 The way I understand it is that manfrotto quick plate will go under the rss clamp and then the l plate on top…?? 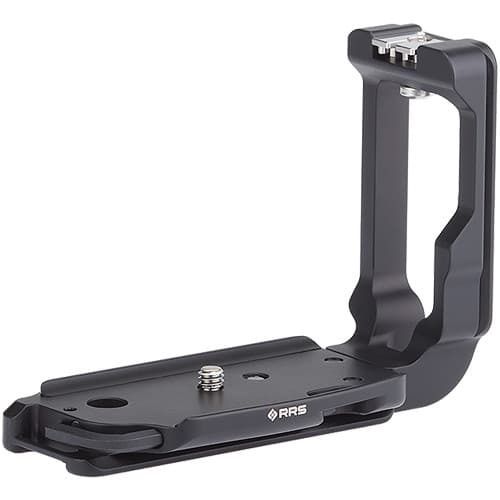 You would need to mount an RRS clamp onto the Manfrotto quick plate. If you talk to the RRS customer service guys they will let you now which one you need. It can be tricky to tell just by looking at the photo as they all look similar!